La Femme Nikita (1991) is probably the first female assassin movie told from her point of view. Twenty years later the formula has been recycled for the new release Colombiana by its very own producer and director of the original, Luc Besson, only he has put Olivier Megaton in the director’s chair whom he shepherded during his production of “Transporter 3.” To view them both back to back is to more closely acknowledge that the first time had an enduring, timeless story and to lament that its successor is a gimmicky freeloader. “Colombiana” to be fair wasn’t exactly boring to me, much of that due to the sleek appeal of Zoe Saldana. It gives you hyper-sensational things to look at captured by jagged camera angles and metallic blue lighting, with Saldana confidently working the space of the frame. The threadbare story zips by in a flash, so unbothered by continuity that you barely have the breath to utter plot holes. After re-watching “La Femme Nikita” I see that Cataleya, the heroine that Saldana plays, does not have the character arc of Nikita. She has become of age to avenge her parent’s death but we didn’t see the grooming of her becoming the lone-wolf killing machine. The movie asks us to make presumptions on Cataleya instead of letting us see her transformation before our eyes. That would be fine not showing us any of that, as done in 1991’s “Nikita,” had “Colombiana” had a lot more going on for the rest of its running time. But storywise it depends on not much more than being a grab-bag of stock movie elements. Perhaps you don’t mind that, but then again maybe you do. In that case, you can be half-entertained only if you happen to like Saldana ecstatically. “La Femme Nikita” is one of the few French action flicks to crossover in becoming a hit overseas. In time it built even a further fan-following amongst movie buffs, a remake called “Point of No Return” (it’s flaccid, take a pass), and it spawned multiple spin-off TV series, with the last and most popular featuring Maggie Q. (Pic, right.) The original had the dynamite punk actress Anne Parillaud who through some charity of makeup was able to transform into a lady. A lethal combination: the hot babe who is also an illusory hit-girl. The opening scenes to me came off as a little too grotesquely punkish the first time I saw it, but now I think they’re necessary. Nikita is cataleptic while her friends knockoff a drug pharmacy that turns into a deadly shootout with police. 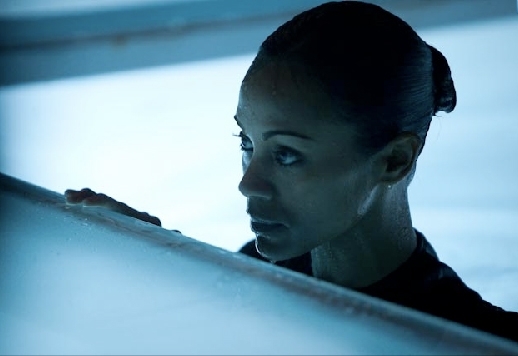 While they think they are rescuing Nikita after the raid, she numbly pulls the trigger on an officer. She is guilty for his death and is pinned with the other two dead officers’ death. All the while in her drug withdrawal she is mercilessly handed a life sentence by the courts, with no probation hearing for 30 years. Government coverts fake her prison suicide and stage a funeral for her. They give Nikita an ultimatum: to become a trained government assassin or meet with death for real. She is locked inside a training compound with an hour to decide. Superbly matching with Parillaud is actor Tcheky Karyo as the French intelligence officer, Bob, who will oversee her grooming process. Bob is a built like cinderblock and is always dressed in black, and he seems just as willing to kiss Nikita as he is to twist her arm or throw her into a body-slam skirmish. These long scenes of Nikita being tooled by the government are engaging. We see her learning and excelling at martial arts, firing at the gun range, computers, lady etiquette and secret service literacy. But she is a rebellious and uncooperative wild animal, and the agency chairperson would rather terminate her. Bob has to have a blunt talk with her that she has two weeks to show progress or the apprenticeship and her life is over. Nikita begins to take the etiquette sessions with Amande (Jeanne Moreau) more seriously. Three years pass and Nikita is granted her first release from the compound where she gratefully joins Bob for a dinner at a posh restaurant, but really turns out to be her initiation assignment. With breathless impulse, she approaches her target point blank. Unfortunately, her exit plan is misguided and she is chased by a posse of avenging gunmen that run her through the kitchen and into a garbage chute. The good news is that by making it out alive, she is liberated to live amongst civilians again. This is freedom but with serious constraints. One false move or revolt from government duty and she will be met with immediate termination without warning. But she is called for assignment (when she’s called the code name Josephine it means she has to go to work), only once every few months. She has time to fix up an “ordinary” life and a romance with a grocer named Marco (Jean-Hughes Anglade) whom she hides her identity from. They have a cute cookie-cutter relationship together like any other twenty-somethings. Some of Nikita’s assignments are surprisingly modest, but in the most interesting way. But it’s not too long until Nikita is playing with sniper rifles in a deluxe hotel while her boyfriend is clueless in the next room. In due course, she is paired up with the live-wire hitman who goes by the moniker “The Cleaner.” He is played by Jean Reno, who got his own Luc Besson vehicle three years later in “The Professional” (1994) where he co-starred with a young Natalie Portman. The two of them, Nikita and The Cleaner, are pitilessly enmeshed in an assignment foul-up and have to go into double-crossing deeds on one another. This is where Nikita realizes she has become accustomed to her ordinary life with a mild boyfriend over her life as a government functionary, and in course of making it out of her predicament alive she also wants to negotiate for personal freedom. Is that kind of negotiation possible in a French film? “La Femme Nikita” is bang-up excitement all the way through but it’s also a suspense tale with dynamic human contradiction.